She was at home and she did not disappoint her fans! 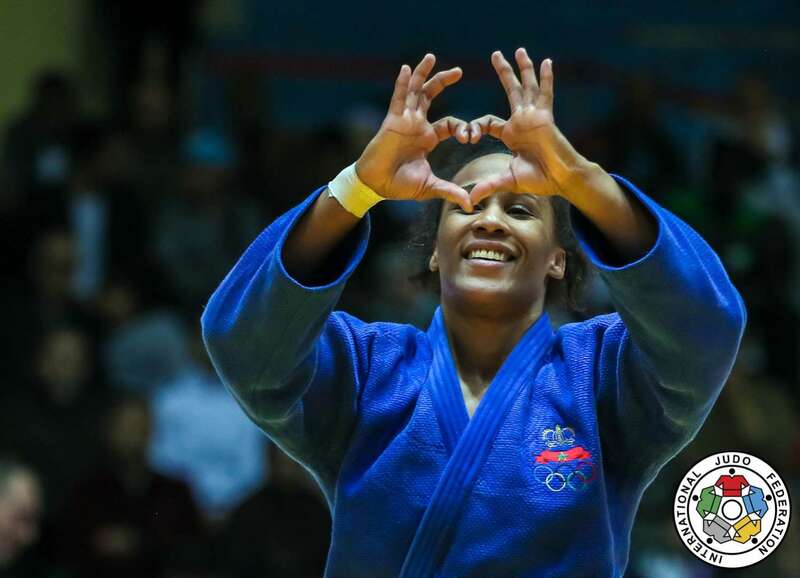 The second day of the Agadir Grand Prix ended with the victory of Assmaa Niang who, in front of her public, won a magnificent gold medal, full of authority and emotion. If Assmaa was among the favourites on the morning of the big day, she found in the final Maria PEREZ (PUR), the vice-world champion of Budapest 2018, a reference in the category. It took only a handful of seconds for the fate of this long-awaited final to be sealed, since the athletes from Puerto Rico made an error which made here penalised with a Hansokumake (direct disqualification). Assmaa, 35, could let her joy burst out and enter into communion with the audience, who was waiting for her champion on the top of the podium. The young woman, who, after her semi-final against Anka POGACNIK (SLO), had come out of the tatami completely exhausted, trying to find behind the scene, a second breath, said at the end of the final: "I am so happy to have won the Agadir Grand Prix at home. I want to thank the Moroccan public who has been my strength today. I have a thought for all the other Moroccan athletes who showed their bravery during these first two days of competition. Moroccan judo is progressing and young people are my deep inspiration. Today I have the age of my goals and my dreams are my energy." This victory should not overshadow the overall performance of Turkish athletes who have achieved the feat, in men, to win the two titles in play. It must be said that the Russian delegation was eagerly awaited since they had aligned competitors of first level such as the Olympic champion -81kg title, Khasan KHALMURZAEV (RUS) who was precisely eliminated prematurely by Vedat ALBAYRAK (TUR), the future winner of the category. KHALMURZAEV appeared below his Rio 2016 level, which allowed him to put his name on the Olympic pantheon. Nevertheless, and it is probably in these moments that we recognise the great champions, while he was in great difficulty against the German Dominic RESSEL (GER), in the final for the bronze medal, he found the resources to win with a superb technical movement. Bravo champion! After his exploit against the Olympic Champion, Vedat ALBAYRAK won masterfully against the Belgian Matthias CASSE in the final, imitating his compatriot Bilal CILOGLU (TUR) who, a few minutes earlier had foiled all the prognoses by getting rid of the other strongman Russian of the day, Musa MOGUSHKOV, by sending him to the tatami on the final gong. This Turkish double is interesting for a country that will soon be hosting a World Tour Grand Prix. It will be in Antalya from April 6 to 8, 2018. After the thirteen medal-winning countries of the first day, four new delegations added their names to the tournament's list. But it is still Slovenia that dominates, with now two titles since Andreja LESKI won the gold medal of the -63kg. It is also interesting to underline Katharina HAECKER's magnificent silver medal, which allows Australia to enter for the first time in a final of the world circuit. There are still five categories to be played during the third day of the Agadir Grand Prix. From Sunday morning, the heavier categories will be in action. World medalists, such as Karl-Richard FREY (GER -100kg), will be looking for gold. In this category of light heavyweight, it will be necessary to be attentive to the competition day of the Portuguese Jorge FONSECA, who has the talent to go to the end. In + 100kg, the former triple World Champion and Olympic silver medallist (London 2012), Alexander MIKHAYLIN (RUS), is still waiting for his return to be successful. So why not in Agadir? During the opening cérémonie, which took place just before the final block of the day, two personalities were honoured by the International Judo Federation for their contribution to the development of the sport: Mr. Kamal Lahlou, Vice President of the Olympic Committee of Morocco (left) and Mr Ahmed Hajji, Wali of the Souss-Massa region (second from the right). 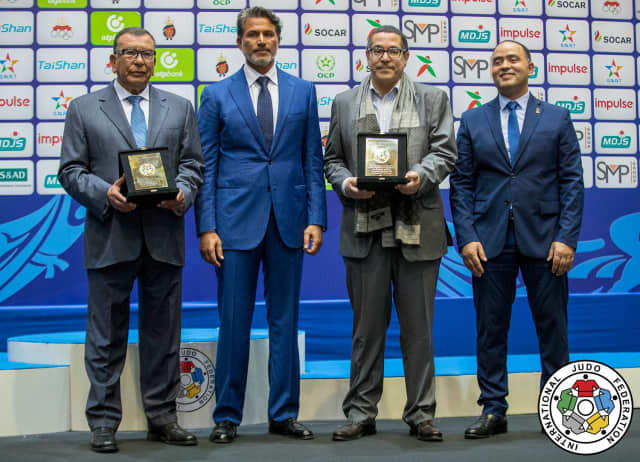 They both received an IJF gold plaque presented by the IJF General Treasurer, Naser Al Tamimi (second from left) in the présence of the President of the Morocan Judo Federation, Mr. Chafik ELKETTANI (right).